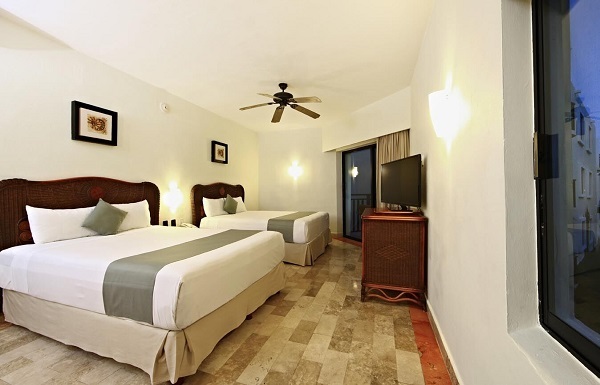 This Eco Resort & Spa is an all-inclusive Hotel in Playa del Carmen. 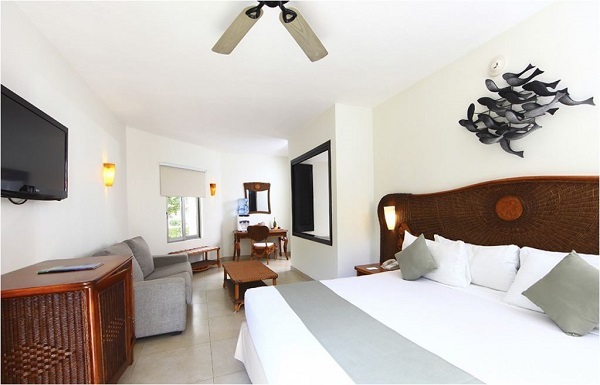 Located on a beautiful unspoiled white sand beach, it is just 15 minutes from the lively downtown. Looking for an excuse to tap into your wild side? 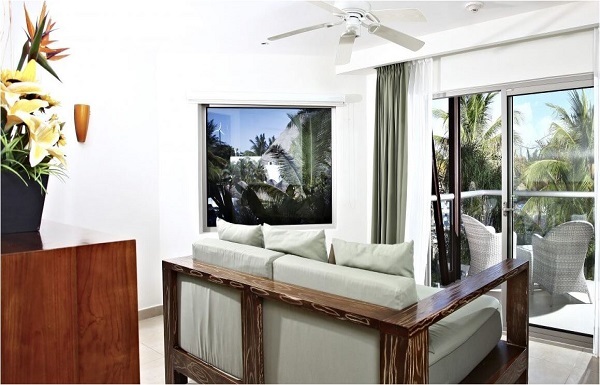 Nothing says nature like waking up to the sounds of wildlife at Sandos Caracol Eco Resort in Playa del Carmen. Built around a natural ecosystem, the resort's dedication to low impact on its environment means the monkeys and tropical birds are right outside the door. Kids love it! Children are a definite priority at Sandos Caracol, which offers a Kids Club for games, crafts and tons of fun from 10 a.m. until 10 p.m. Topping it off, everyone is sure to love the water park with 29 water slides and wet-and-wild fun for kids, teens and grown-ups. Mayan shows in stunning outdoor locations. Eco Collection, Royal Elite, Select Club Adults Only 18+ and Sanditos Family Section buildings. Bermuda shorts, nice sandals and sleeved shirts are allowed. Bathing suits, flip flops / plastic sandals and sleeveless shirts are not allowed. Reservations not required, restrictions apply. Reservations are required and can be made at front desk. Reservations are not required, restrictions apply. Shoes, shirt and pants/shorts required. Offering service in the afternoons and evenings. Serving à la carte breakfast and lunch exclusive for Select Club Adults Only guests. Enjoy cocktails, coffee and assorted pastries and cookies. Oceanfront nightclub open from 11:00pm – 2:00am. Offering service in the mornings and afternoons. All meals included every day: Buffet Breakfast, Buffet Lunch, Buffet or à la carte Dinner. 24 hours all inclusive. 2 Tennis Courts unlimited day and night use within schedule of operation (reservation required). Includes equipment (balls & rackets), proper attire and court shoes required. conditions). Snorkeling gear (1 hour per day) and introductory Scuba Diving lesson in pool (once per stay). Gym: free use of fitness equipment, sauna, steam room & Jacuzzi (18 + years). 3 Pools: 1 Exclusive for Select Club Adults Only 18+ Guests, 1 Chill Out Pool, 1 Activities Pool with separate children area. Splashing Water Park for children & adults with 29 fun water slides and games surrounded by water spouts. Kids Club from 10:00 am to 10:00 pm with fully supervised activities program such as: children’s pool, games and arts & crafts and mini disco. Teens Activities for 13 to 17 years old with assistance of our animation and sports team. Music, pool tables, table tennis, foosball (table football), beach soccer, etc. Trendy Disco Bar with music from 11pm to 2 am (18+ years). Water Park with 29 fun slides and water games surrounded by water spouts for children & adults. arts & crafts and mini disco. Baby Club for the ages 2-3 years from 10 am to 1 pm and 3 pm to 6pm. One King Bed or Two Double Beds. Bathroom with shower, including hair dryer. Air conditioning, ceiling fan, cable T.V., radio alarm clock, telephone, minibar with mineral water, soft drinks and beer (restocked every other day), water dispenser, safety deposit box, balcony or terrace with Garden, Pool or Jungle view. The perfect room option for guests seeking child-friendly accommodation. 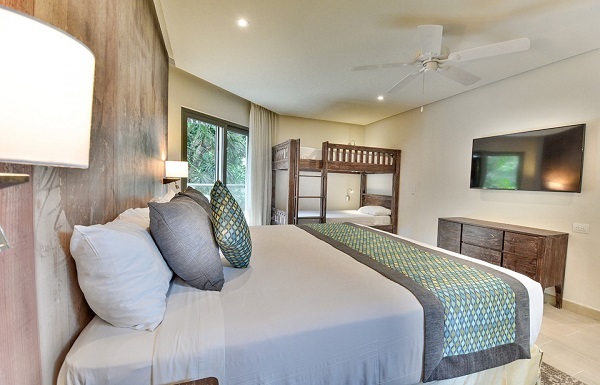 Featuring modern style decor inspired by the surrounding jungle, these rooms have a king size bed and a bunk bed for two children. You’ll also find upgraded amenities like free in-room Wi-Fi, 24-hour room service, plus bathrobes and slippers for added comfort. Perfect for guests who want a little something extra when it comes to accommodation such as comfortable bedding, jungle inspired decor, Wi-Fi access, full sized balcony, and much more. You will be able to order 24-hour room-service, perfect for those days when you are too lazy to wake up and go to breakfast. During your stay in the Select Club Deluxe room option, you’ll enjoy upgraded amenities and services including bathrobes and 24-hour room service. You will have access to special areas like the exclusive adults only pool and beach club. More importantly these room options have an in-room Jacuzzi where you can lay back, relax, and enjoy a glass of wine or some room service. This room includes one king size bed and one sofa bed. For extra space and luxury by the beach and pool! Created with families in mind, these contemporary-styled suites have a bedroom plus separate living room with double sofa bed. Guests staying in these accommodations also get extra amenities like Premium liquor, 24-hour room service, in-room WiFi and cozy bathrobes and slippers. This room includes one king size bed in the master bedroom and one sofa bed. You will love the location in their pool and beach area! These luxuriously designed rooms have been created with eco-sustainable services, such as water heated by solar cells, and LED lights, as well as special amenities such as premium liquors, 24-hour room service, in-room WiFi, and slippers and slippers. This room includes one king bed or two double beds. Created for families looking for more space. Each one has a master bedroom plus a separate bedroom for children with a bunk for three. The bathroom includes two showers, two sinks and two toilets, and you will also enjoy special services such as WiFi, robes, and room service. And best of all ... a mini pool on the balcony that your children will love! Their biggest rooms for families! Parents can relax in the master bedroom with 50 "LED screen, Bluetooth music network, and bathroom with double sink. The second bedroom has a bunk for three children, sofa and additional bathroom. You'll also find WiFi in the room, 24-hour room service, and bathrobes and slippers. 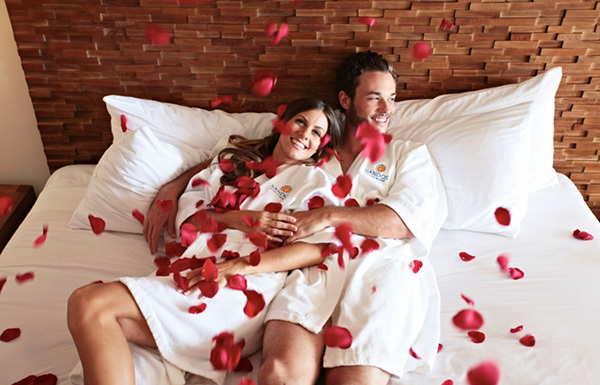 Pamper yourself with an outdoor Jacuzzi in our more spacious Adults Only rooms! These suites offer a master bedroom and separate living room, as well as special amenities such as gowns and 24-hour room service. You will also have access to the exclusive Select Club pool and beach club. This room includes one king size bed and one sofa bed. Relax completely in the jacuzzi inside these luxurious rooms, located in the beach area and main pool. Each of these rooms has a bedroom area plus a living room with a sofa bed. You will also receive amenities such as Premium liquors, 24-hour room service, WiFi in the room, and comfortable bathrobes and slippers. Bike Path: This route is designed to familiarize our guests with our property's abundant natural attractions. You can choose the path that is best suited to your physical capacity. This circuit consists of three sections that will carry you through the jungle. Underground Spring Route: This path winds through the jungle among a series of natural underground springs that are located within the property. You’ll enjoy learning how these bodies of underground water, which are characteristic of and unique to the region, have developed into a complex system over the past several hundred years. Mangrove Path: Explore, discover, and enjoy one of the most important habitats the coastal zones of the Mexican Caribbean. Romantic boat ride: Experience a relaxed boat ride through a winding natural river that allows you to come in contact with a diverse array of native plants and animals (reservation required, couples only). Aviary/Bird Sanctuary: Admire a great number of multicolored birds that freely interact in a natural location among lush vegetation and incomparable beauty. Deer Encounter: Quietly arrive at the grounds and admire these white-tailed deer. Observe them interacting with other species and take unique pictures. Discover the Mayan Jungle: Whether morning, afternoon or night, stay alert and we’re certain that you’ll observe some of the wildlife present at our hotel. We have more than 60 species of mammals, birds, reptiles, amphibians and crustaceans. Iguanas: You can admire an infinite number of iguanas from the region throughout the Sandos Caracol complex. You’ll have the chance to view these prehistoric examples of jungle wildlife at close range and take pictures to remember your experience. Mangrove Crabs: These peculiar inhabitants of the mangroves will surprise you with their bright colors, strange walk and unique characteristics. Due to their reproductive cycles, you are most likely to see them between May and September. Plant a Tree: We support the protection and conservation of Mexican forest in the state of Quintana Roo. Be part of this important program. Eco Club Nursery: Visit our nursery and get to know all the native plants of the region. If you wish to participate in our program of plant propagation, you can help us plant much more than just a tree. Mayan Herb Garden: Discover some of the secrets of traditional Mayan medicine and open yourself to the surprises of the unbelievable benefits that a large number of native plants hold for you. Orchids: Admire the incredible beauty of these singular plants and allow yourself to be carried away by the haven of peace and tranquility that you’ll encounter in this lovely space. Mangroves: All throughout our complex you’ll have the opportunity to encounter and admire this surprising natural habitat that serves as a refuge for a large number of wildlife species. Organic Garden: In this space you can learn some vegetable growing techniques to try out at your own home. Promote sustainability by sharing your knowledge—and your organic produce—with your neighbors. details that only the Maya jungle offers, like our underground springs, wildlife, and beautiful flowers characteristic of this region. Eco-Tour Kids: Our Kids Club staff has a surprise for your children. In this area specially prepared for little ones, we’ll teach them to respectfully interact with the environment. Eco-Tips: Throughout our resort you will find ecological suggestions that will help you lead a more sustainable lifestyle and that will allow you to save money while caring for the environment. Carbon Footprint: During eco-talks and through clear examples in our hotel you’ll learn how, at Sandos Caracol, we are supporting the environment by saving energy and generating less carbon dioxide emissions (CO2). For example, you can enjoy the hot water in our ecological rooms with a clear conscience, because all of our water is heated without contaminating the environment. With diverse, innovative projects we have succeeded in reducing our CO2 emissions by up to 70 percent. Package includes 30 people. Extra charge for additional guests applies. Combinable with a legal ceremony. *Terms & conditions apply. Please check with your Certified Destination Wedding Specialist for more information. Rooms and passengers booked outside of the group agreement do not count towards earning the Preferred Partner Perks benefits. 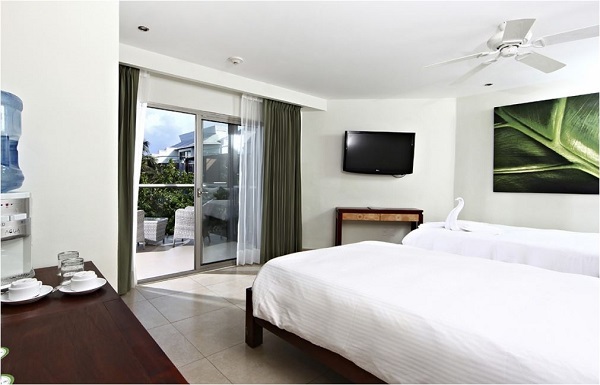 **Complimentary room is a monetary refund at the time of travel not including hotel taxes, fees, and transfers. The value is based on the room category booked by majority of the group for the least amount of nights. Nights are calculated on a nightly basis and not cumulative. A surcharge may apply dependent on time of travel which will reduce the value of the credit. Rooms and passengers booked outside of the group agreement do not count towards earning the Preferred Partner Perk benefits. 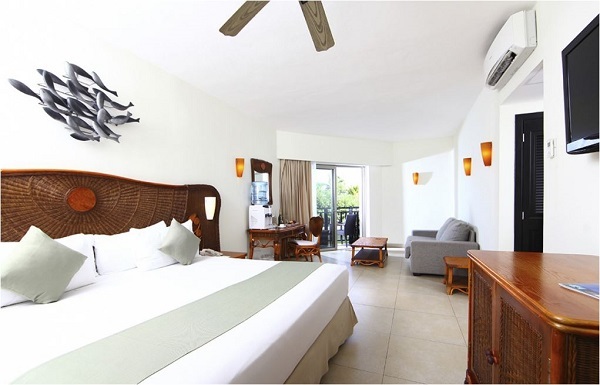 * Upgrades are based on availability upon arrival at the hotel. DestinationWeddings.com makes every effort to keep the travel and resort information up to date on this website, however, resorts, wedding packages and laws do change, so we cannot guarantee that all information on particular resorts or destinations are completely accurate at the time of viewing. Before making marriage decisions on a particular destination and travel plans, we highly recommend you speak with your specialist or wedding coordinator.